We offer large, outdoor and indoor LED signs that will make your cinema business grow faster because of the high visibility of content and the flexibility of information that you can display on our LED signs. The LED screens offered by us can be placed inside and/or directly beside the cinemas. LED signs are highly effective display devices that enable a continuous and dynamic flow of all relevant information or their instant change and replacement for other content on demand. Providing cinemas with our high quality LED screens results in better information provision for both staff and the customer. The features that can be displayed on our LED signs vary from welcome boards, clock and date information, schedules for film projections, film news, general building sections marking, or advertising applications. 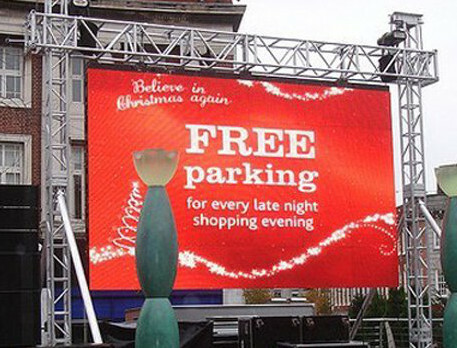 The advertising of cinema related content can also be provided by placing our LED signs outside cinemas in densely populated areas such as city centres, or any place that offers a good point of visibility such as motorways or any other aspect that can reach a new audience or attract customers.